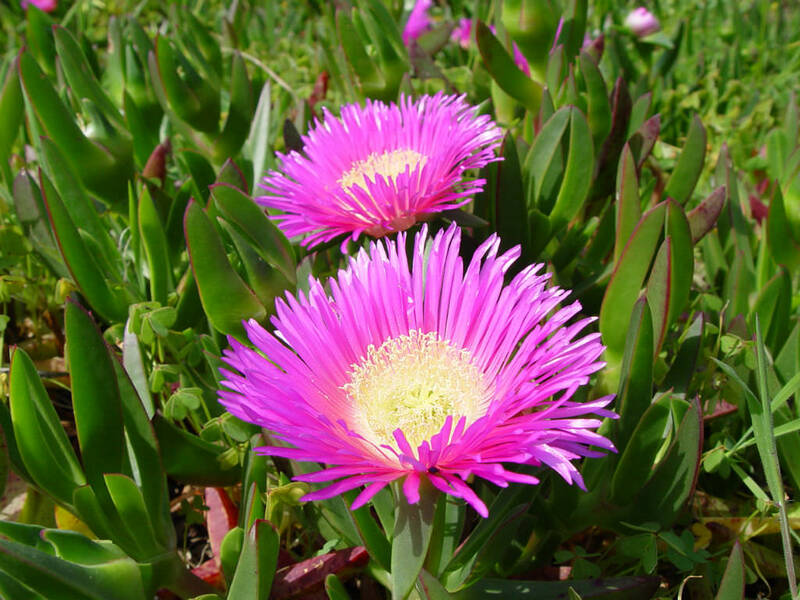 Carpobrotus acinaciformis is a fast growing, mat-forming succulent perennial with flat-growing, trailing stems up to 3.2 feet (2 m) or longer. 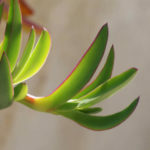 Yellowish to grass-green leaves, crowded along the stem, opposite, in pairs, up to 3.5 inches (9 cm) long and up to 0.8 inch (2 cm) thick, sabre-shaped, triangular in cross-section, curved upward. 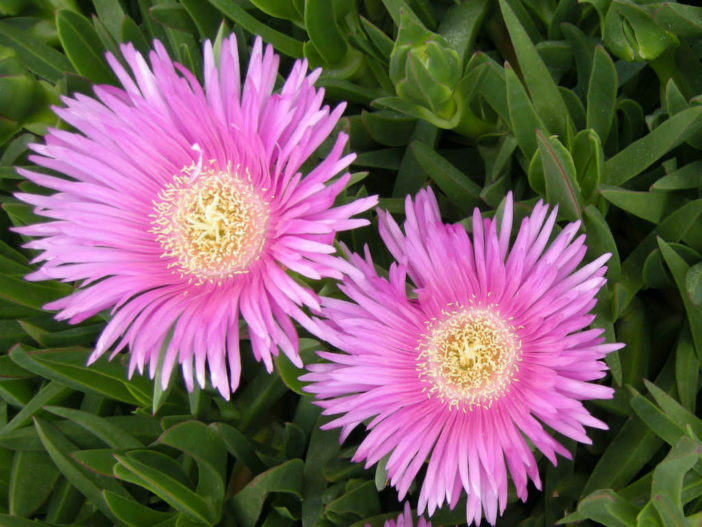 Solitary flowers (brilliant pink-violet to dark magenta) at the end of a short stalk, hermaphrodite, up to 6 inches (15 cm) in diameter, daisy-like with many stamens (400-600) surrounding a starfish-like stigma. Fleshy fruits, constricted at the base, indehiscent, up to 1.2 inches (3 cm) in diameter, shaped like a spinning top on a winged stalk. USDA hardiness zone 7a to 9b: from 0 °F (−17.8 °C) to 30 °F (−1.1 °C). 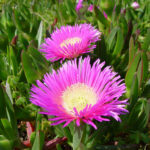 Growing Carpobrotus in containers is ideal, and you can overwinter them in temperate regions. Just bring the pot in and water it deeply. 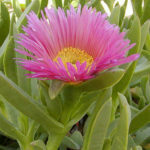 Cut back the plant and let it dry out and languish for the winter in a warm location. 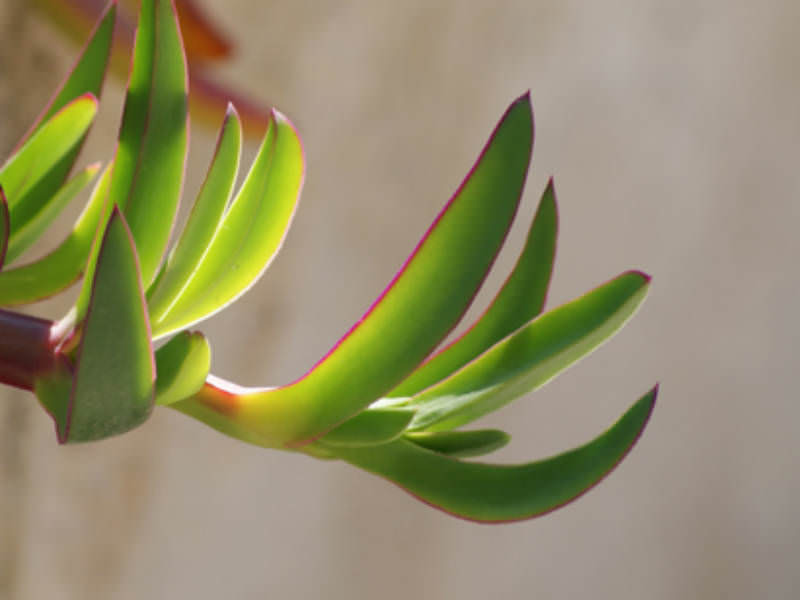 In March, resume regular watering and move the plant to a full light situation where it has some protection from burning rays. Gradually reintroduce the plant to temperatures outdoors until it can tolerate a full day outside. 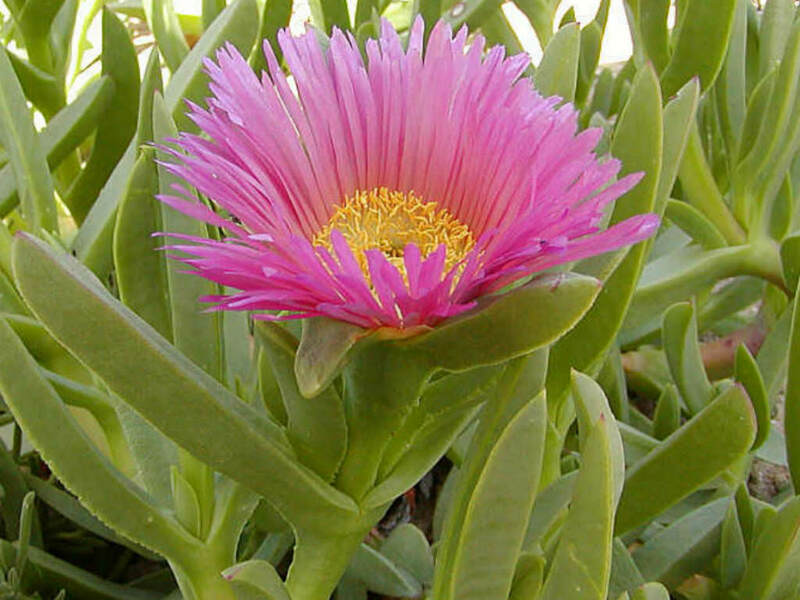 Native to the coastal dunes of the Western Cape, South Africa.